This comprehensive text serves as a practical, guide to preparing a written research report. It also provides a checklist for thesis preparation to ensure that no steps or key components are overlooked. Researchers will be able to present results and findings to examiners and fellow clinicians in an accessible format. 1. Overview of this Book. Introduction. An Overview of the Health Sciences Thesis Structure. 2. Supervision and the Chances of Success. Student Completion Rates (What are the Odds?). Supervision Arrangements. The Student-Supervisor Dialogue. Meeting Frequency between Students and Supervisors. Meeting Purpose and Content. Preparing Written Work for the Supervisor. Student Access to Resources. Managing Student-Supervisor Conflict. Managing Supervisor-Supervisor Conflict. 3. General Writing Techniques and Strategies. Telling Them! The Importance of the Thesis Plan. Thesis Drafts. Dealing with Writers Block. The Writing Environment and Tools. What to Write With. Document Safety. The Psychology of Thesis Writing. 4. Determining the Scope of the Research Programme and Thesis. Thesis Size. Research Programme Scope. 5. The Introduction and Literature Review. 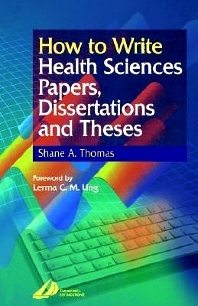 The Functions of the Thesis Introduction. Developing the Thesis Rationale. How to Write a Literature Review. Evaluation and Critique. Size of the Introductory Chapter. Selection of Literature for Inclusion in the Literature Review. Thesis Aims and Research Questions. 6. Keeping Your Literature Under Control. Computer-Assisted Literature Searching. Searches of Collected Printed Abstracts. Manual Searching Methods. Consulting Other Experts. Suggested Order of the Different Types of Searches. Organisation and Filing of Literature Materials. The Scope of Literature Collections. Bibliographic Software. 7. The Thesis Methodology. Research Participants/Subjects. Research Tools. Protocols and Procedures. The Methodological Defence. 8. Ethics Procedures. Ethical Principles. Common Questions Encountered in Ethical Clearance Procedures. Informed Consent. Ethics Records. 9. Writing the Thesis Results and Discussion. The Organisation of the Presentation of Results and Discussion Chapters. Presentation Design Principles for the Results Section of Theses. 10. The Thesis Conclusion. Summary of the Outcomes of the Literature Review. Major Findings of the Thesis and how they Integrate with Previous Work. Strengths and Limitations of the Research. Future Avenues of Research. The Process of Writing the Concluding Chapter. 11. The Thesis Abstract. The Function of the Abstract. How to Write the Abstract. 12. The Final Production of the Thesis. The Thesis Structure. Preparation and Production of Figures. Duplication and Printing of the Thesis. Proofreading. The Final Hard-Bound Copies. 13. The Examination of the Thesis. The Submission and Examination Process. Typical Format of a Thesis Examination. Examination Reports. Some Observations on the Selection of Thesis Examiners. Reconciliation of Examiners Reports. How to Deal with Revisions. 14. Publications and the Thesis. Academic Authorship Conventions. When Should Publication from the Thesis Occur? Conference Presentations. Journal Publications. Book Chapters and Monographs. Publication in the Popular Press. 15. The Last Word. References. Annotated Thesis Writing and Research Bibliography. Appendix: Thesis Preparation Checklist. Index.